Junior Tuskers lost to the defending champions Hong Kong at Asia U19 Rugby Championship in Singapore 24 – 13. Hong Kong were clear favourites after they thrashed Chinese Taipei 78 – 12 on Sunday. Sri Lanka too beat the hosts Singapore on Sunday 27 -12. However, the much expected game could have been won by Sri Lanka but few errors in the last quarter let them down. At the 60th minute score remained stood at a one point deficit 13- 14 in favour of the Tuskers. Hong Kong’s Mathew Worley scored the first try with a fine run and a step on Buddima Piyarathne the Lankan full back. Worley is currently on a one year trial with the French giant and Dan Carter’s club racing Metro. Hugo Stiles made the conversion. Then came a brilliant run by Nishon Perera but he was stalled by the Hong Kong full back. Nevertheless, the Tuskers received a penalty and Isuru Kongahawatte made the points. Prior to that Reeza Raffaideen missed a kickable penalty. Hong Kong dominated the scrum most of the time, and in the 20th minute Kevin Dixon received a yellow card for a deliberate knock–on. Stiles opted the kick in to touch for the territorial play with a push and shove from the lineout. Stiles showing all his skills made a brilliant cross kick and the right winger Hugo Chui catching the ball inside the try line resulted another 5 points. 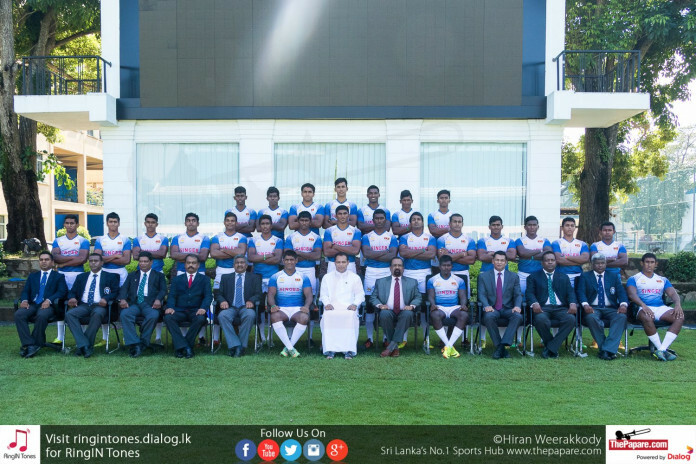 In the 28th minute Sri Lanka won two penalties inside the 22m mark, Kongahawatte had all the time to make another three points instead he took a quick tap at the 1st attempt and captain Omalka Gunarathne opted for the scrum in the second attempt, which was a poor decision especially with a man down as a result of lost possession. Few minutes before the half time Omalka showing his brutal run, made a stunning try beating 5 Hong Kong players but Kongahawatte missed the extras. Omalka and Nishon made some spectacular runs in the first half, and even in the third quarter of the game. Tuskers giving possession away from the contact was a real issue when going into the opposite half. Nishon Perera scored a well-deserved try in the 55th minute butRaffaideen missed the conversion. During the 60th – 70th minute neither team managed to trouble the score board, however, Hong Kong dominated possession in the Lankan half. A comedy of errors by both teams in the lineout, Sri Lanka had the chance to come out of jail but a flat throw saw Hong Kong winning the ball without any trouble. Hong Kong looked solid in the 22m as Tuskers were scrambled in defense. Persistent infringement in the scrum resulted in a penalty try for Hong Kong. Sri Lanka had a series of missed opportunities and Hong Kong nailing another penalty in the 78th minute took away the Tuskers hope of coming back into the game. Decision making, losing possession at the breakdown and scrums, kicking the important points were the failure of this match. Sri Lanka will play the next game on the 19th Saturday against Chinese Taipei and Hong Kong will play Singapore. However, it looks more than likely that Hong Kong will defend their title and compete in the World Rugby U20 competition in Zimbabwe next April.